So as you may have guessed already, I am a sucker for anything weird and creepy, and anything involving zombies. The social commentary around racism was just an added bonus, as I love anything that tries to tackle those kinds of issues in a way that gets younger readers thinking about them. B is an interesting character, raised by an abusive, racist father and a mother who's often on the receiving end of that abuse. B tries to intervene whenever there's physical abuse, but doesn't seem to have many problems going along with dad's racist tirades, just to keep in dad's good graces. Since the book is from B's perspective, we get to see first-hand someone trying to come to terms with the fact that what your parents teach you isn't always right. Over the course of the story, we see B hanging out with Vinyl, a close friend who is black, and being annoyed that dad doesn't think that Vinyl's the kind of kid that B should be hanging out with. But then pages later, B hurls the same racist epithets towards minorities that B's dad does, knowing full well that it's hurtful and wrong. It's difficult to read a story where your protagonist is a violent, fist-fight starting racist. Sometimes, you have a hard time rooting for B, who spends a lot of time being absolutely despicable. But there are glimmers of hope throughout the story that B is going to learn to separate from dad's influence, especially once survival becomes more important than skin color or ethnicity. The writing level in this book seemed sort of low, almost like it was a middle grade book, if not for all the gore and zombie violence. I'm guessing it seemed like an easier read because it was written in first person from B's perspective, so we get a lot of rambling thoughts and lists of every single person who is in a room, etc. It did make for a quick read, even if the language did feel a bit stilted from time to time. Something also happens at the end which is a bit of a shocker -- like a genuine, did-not-see-it-coming shocker -- but it also comes with a complete personality transplant for one of the characters which made all of the previous build-up and character development feel cheap and, honestly, kind of sexist. I can't really say much more without spoiling it, but if anyone else reads this book and feels the same, I'd love to talk about it! There are a lot of great ideas in Zom-B, including how people react to sporadic zombie outbreaks -- are they conspiracies? Lies? Real life? Who knows. Unfortunately, it doesn't always feel like the great ideas live up to their real potential. Characters die and you don't even feel bad because you never got a chance to know any of them or get invested in them as people. Many of the interesting scenes in Zom-B -- particularly the opening pages and one briefly recurring character who B nicknames the Owl Man -- don't quite pay off in the way I'd hoped. Zom-B is the start of a series, so I'm guessing those are the sorts of scenes which are going to tie the rest of the books together. 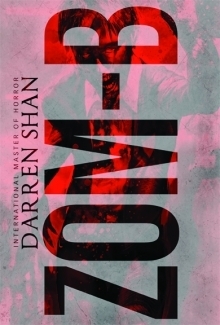 Even though Zom-B wasn't a perfect book, it was short and a fast enough read that I'd be interested in checking out the rest of the books to see what kind of twist Shan and company give to the zombie genre. Due to a lot of gore, violence, scenes of abuse, profanity, and racist language, I would recommend this book for older readers.